There have been a lot of interesting occurrences in the history of the Olympic Games. Although not being directly relevant to sports, they stuck in memories forever. One of such episodes is the story of Armenian-born athlete and actor Haig Prieste. 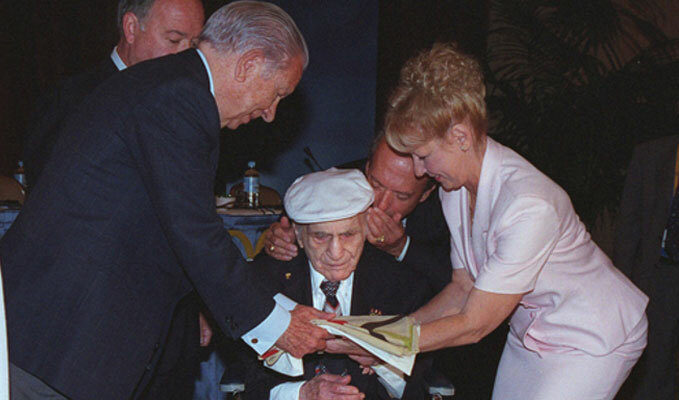 PanARMENIAN.Net - Hal Haig "Harry" Prieste was born on November 23, 1896 in Fresno, California, to Armenian immigrant parents with original surname Keshishian. Prieste first took "Harry" as his American name, but switched to "Hal" when started a career in acting. Being a diver as well, he became the U.S. champion in 1920 and participated in the 1920 Summer Olympics in Antwerp, Belgium. He was the first Armenian born athlete to win a bronze medal at Olympics for 10 meter platform diving.However, it’s not the medal that made him famous. Prieste is known for taking the original five-interlocking-ring Olympic flag as a prank. Challenged by his friend, swimmer Duke Kahanamoku, Prieste shinnied up a 15-foot flagpole at the end of the Games and stole the official flag. For 77 years the flag was stored in a suitcase during his years in swimming and diving shows, as a vaudeville comedian, a tumbler, a banjo player, a circus juggler and an Ice Follies performer. Prieste did not regard the flag as valuable or worth returning until a reporter told him at a United States Olympic Committee banquet in 1997 that the International Olympic Committee had been unable to find the missing Antwerp flag, the first one with the five rings. He returned the flag 3 years later at the start of the IOC’s annual meeting in Sydney. “I thought I ain’t going to be around much longer — it’s no good in a suitcase,” Prieste said after handing the folded linen flag to International Olympic Committee president Juan Antonio Samaranch, who gave him a commemorative Olympic medal in a box. "What is it? Kleenex?" the 103-year old reacted. IOC vice president Anita DeFrantz introduced Prieste to the session as a “living legend,” adding that he had run in the Olympic torch relay at Atlanta in 1996 at the age of 100. At that age he was still doing push ups and had just quit ice skating. The flag was slightly discolored and tattered along the edge where Prieste ripped it off the flagpole, but otherwise in good condition, the USOC said. The Antwerp Olympic Flag is now on display at the Olympic Museum in Lausanne, Switzerland, with a plaque thanking him for donating it. Prieste died on April 19, 2001 in Camden, New Jersey, at the age of 104. 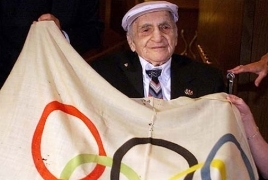 He was the world's oldest former Olympic medalist and the first known Olympian whose lifespan covered three centuries (1896 - 2001). Armenian wrestlers share impressions on European Championship Armenia's Greco-Roman wrestling team headed by Olympic champion Levon Julfalakyan came back home with one gold and two bronze winners. Armenia sets record, climbs 41st in FIFA rankings Review of February 10-17 sports events.